Earn 2,500 bonus Starpoints for every five eligible nights you stay (up to 10,000 bonus Starpoints and 20 eligible nights). 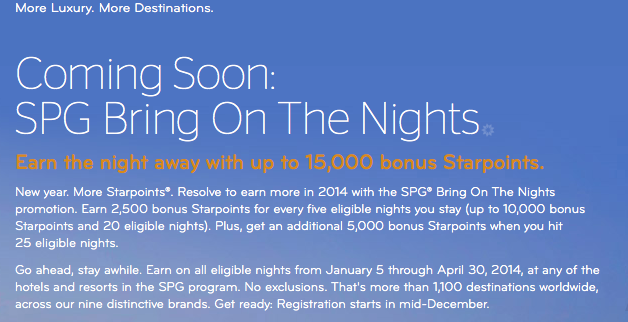 Plus, get an additional 5,000 bonus Starpoints when you hit 25 eligible nights. The promotion is valid for stays January 5 - April 30, 14 and all Starwood properties are participating this time! Registration will start sometime in mid-December and you must register by February 28th to earn the bonus Starpoints.